Babieka Films was created in 2013 by a team of professionals with a lot of experience in the film industry. The team joined together to create the best production company in Spain. Over 20 years producing, co-producing, and offering production services have given the founders of Babieka an excellent reputation of quality and efficiency in Spain and abroad, as well as very solid relationships with local, national, and international companies. The Promise required filming at an active mining field next to a train track with daily traffic. Activity of the quarry would have to cease during filming. The production would entail recreating this site into a working field, a prisoner´s field, and an excavation area with explosives, requiring a great leap of faith by a specialist. On top of collaborating with the owners of the mine and obtaining the necessary permits, the main priority in this job was safety, considering the large number of extras in the film. We coordinated with the employees of the mine, assisting in drawing up a contract. 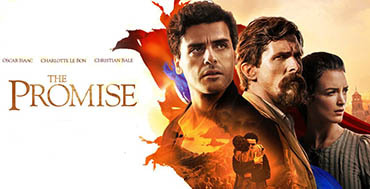 The Promise is a major production about the Armenian exodus, and its quality speaks for itself.